When we think of fire alarm systems, we consider them to be our first defense against fire danger — but not danger caused by intruders, active shooters, or other human threats. 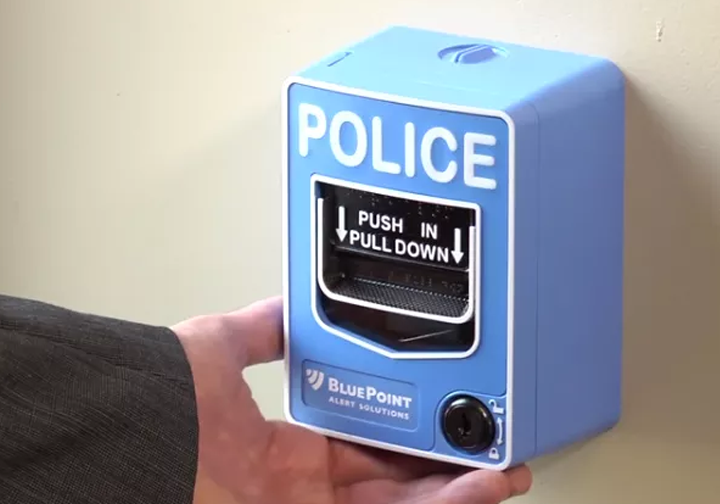 BluePoint Alert Systems work for law enforcement just like a fire alarm works for the fire department, providing instant notifications in the most urgent situations, significantly reducing the Police response time when seconds count. 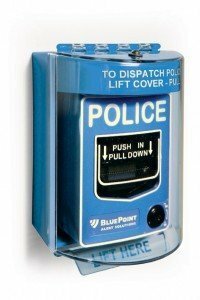 Much like a fire alarm system, the BluePoint Alert System is composed of a series of highly visible elements; pull stations, strobes, and signage all in blue color. The system being wireless is both flexible and expandable, the individual elements of your system are custom engineered to the facility in need of protection. In addition to instantly contacting police, the system is integrated into any existing PA system to broadcast an automated message throughout the building, and a text/email alert is also initiated to a list of building officials. 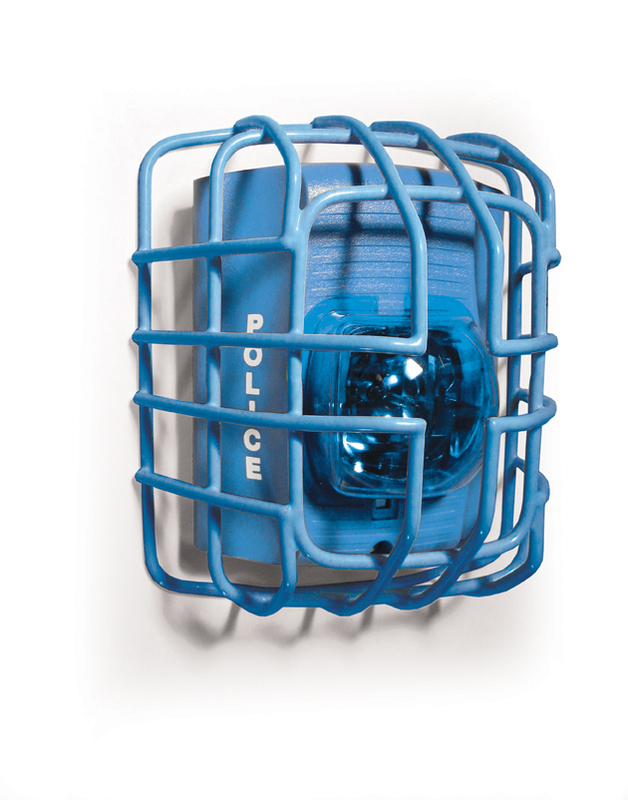 Fixed Wall Units with Optional Covers: Similar to Fire Alarm Pull Stations, these blue colored units marked “Police” are strategically placed throughout the facility (School, Theater, Government Building, any public gathering space). They are available for anyone to initiate at anytime, and require little to no training to activate. Clear polycarbonate “lift to access” covers are available to protect against accidental activation from physical damage or to protect from the elements. Portable Remote Devices: A wearable remote device can be assigned to strategic personnel, who can activate the system within a 2-mile radius of the building. Notification Systems with Optional Strobe Guards: These units, integrated with an existing PA system, provide strobe lighting support for alerts both indoors and out. Signage and Decals: High visibility blue signage is available to support system instruction and awareness for occupants, ensuring that they use the tools provided in the case of emergency. The system can be integrated with a security camera system to allow building officials and police to view areas of the building to locate the threat. Automatic Door Closing and Locking, Breaking Glass Detection Medical Alert, and a Secondary Communication System are all valuable enhancements. 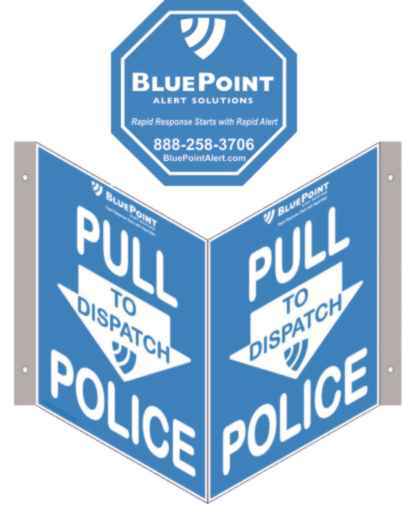 As soon as a BluePoint Alert System is activated, either by fixed unit or portable device, two messages are initiated. Instantly an alert is sent via radio signals to police dispatch and facility leaders, notifying them of the alert and location information. Simultaneously, the PA System Message automatically broadcasts a warning announcement on site, accompanied by strobe lighting at all fixed wall units. Response Protocol: The facility’s occupants can immediately follow protocol to protect themselves. Police Dispatch: The nearest police officers are contacted and sent to the scene for rapid, focused response. Call List: A pre-set list of key contacts receive a message notifying them of the threat. This procedure reduces risk in the event of a dangerous incident, with a faster on-site police presence and rapid method of placing occupants on alert and in defense protocol. 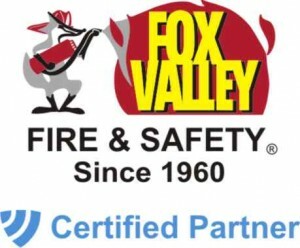 The Fox Valley Fire & Safety Team offers support and technical expertise as a certified partner in BluePoint Alert systems. Our experienced team of safety professionals offers design and installation as well as service, inspection, maintenance and repair services for both BluePoint and traditional fire alarm systems. For more information or to get started with BluePoint today, contact Fox Valley Fire & Safety today!